1) You will get up to Rs. 20000 discount on flight booking! 2) Up to Rs. 5000 discount on hotel booking and instant discount of 10% on bus tickets. 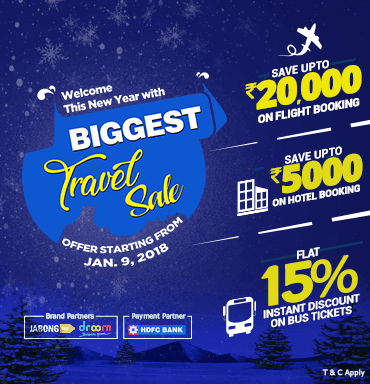 Visit EaseMyTrip.Com Book flight tickets, hotels and bus tickets for your preferred destination by applying coupon code: WELCOME2018. 🐞Convenience fee of Rs. 250 will be charged under this offer on flights. 🐞The offer can’t be clubbed with any other promotional offers or any other offer running on EaseMyTrip. 🐞One user can avail cash back offer only for once. 🐞Under this offer, 50% instant discount will be given by us while rest of the 50% will be credited as cash back through HDFC bank. 🐞Cash back will be auto-credited within 90 working days of the date of the transaction. 🐞In case of partial/full cancellation the offer stands void and discount will be rolled back before processing the refunds. 🐞Child / infant discount, date or flight change, refund charges, weekend surcharge, black out period, travel restrictions and / or flight restriction will be also applicable as per the fare rule. 🐞Changes in flights and dates are allowed with change fees and fare difference.